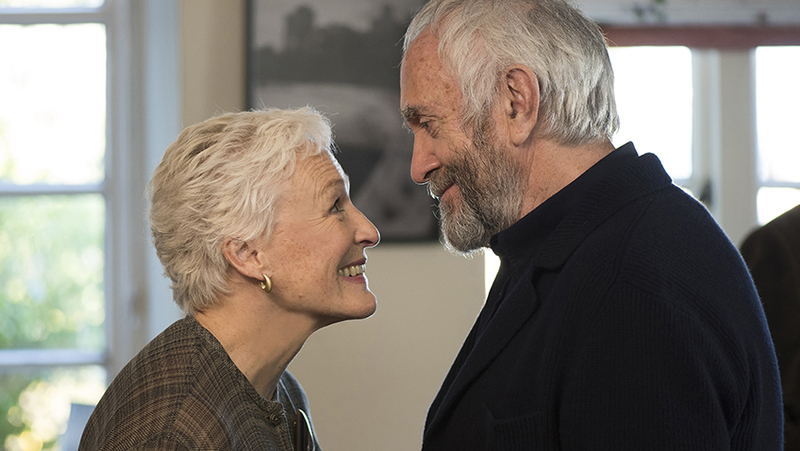 Home / LIFESTYLE / REVIEWS > / DVD REVIEWS / Will Glenn Close win an Oscar for Best Actress? The Wife (Picture House Entertainment). Glenn Close is excellent as the wife of a celebrated writer (Jonathan Pryce) who has won the Nobel Prize for Literature. When she was young and a writer in her own right she was warned by an older writer that because she was a woman living in a man’s world she would never succeed. She would write but she would never be read. So she decided the only way for her to succeed would be to ghost write all her husband’s books. Björn Runge directs in a somewhat pedestrian way, but Close, Pryce and Christian Slater as a hack writer who suspects the truth and wants to write the writer’s biography are always very watchable. A Private War (Altitude). Rosamund Pike plays Marie Colvin, the famous war correspondent, who was killed in Homs, Syria, in 2012. Nobody in their right mind would want to do what Colvin did. “I hate being in war zones”, she said, “but feel compelled to see it for myself.” She went to Sri Lanka, Iraq, Afghanistan and Lybia, dedicated to making her readers fully aware of the human cost of war. Such were the horrors she witnessed (mass graves, mutilated bodies) she suffered from post traumatic disorder. However, that did not stop her returning again and again to the war zones and facing the nightmare terrors. Matthew Heineman’s film makes for grim viewing. Anything less would be pointless. Disobedience (Curzon Articial Eye) is a story about religion and its rituals. Chilean-Argentine director Sebastián Lelio directs a lesbian drama, which takes place within a Jewish Orthodox community in Hendon. A photographer (Rachel Weisz) working in New York, has rejected Judaism. She returns to the UK for the funeral of her father, a rabbi. She finds her former lover (Rachel McAdams) is married to a man (Alessandro Nivola) who is about to be elected rabbi. How will he cope with her return? What are the options? Will he able to give his wife freedom of choice and allow her to divorce him? What will she do? Is a ménage a trois on the cards? Rogue Male (BFI), directed by Clive Donner, was made for television in 1976 and never had a proper cinema release. The story was written by Geoffrey Household in 1939 and feels like a good old-fashioned Boys Own adventure by John Buchan. An English aristocrat (Peter O’Toole) attempts to assassinate Hitler in his Bavarian holiday retreat. He is captured and tortured but still manages to escape to England. He is pursued by the Nazis and hides in a fox-hole. Here he and a Fascist British toff (John Standing) engage in some very artificial political banter. O’Toole is completely up-staged by Standing. A Quiet Place (Paramount) Post-apocalypse science fiction horror movie played out in silence. There is very little dialogue. It’s all sign language and subtitles. If anybody speaks or makes a noise they are liable to be instantly killed by monsters which remain off screen most of the time. This much overrated film would be much better if they were seen only fleetingly and never in close-up. John Krasinski directs. He also wrote the script and plays the leading role of dad trying to keep his family alive. Emily Blunt plays his wife, who is going to have a baby. Babies cry and make a lot of noise. Krasinski and Blunt are married in real life. Won’t You Be My Neighbor? (Focus Features) is Morgan Neville’s affectionate documentary tribute to Fred Rogers (1928-2003), famed American TV personality and puppeteer host to the pre-school TV series Mr Rogers’ Neighbourhood. He had a very special affection for and rapport with very young children. He respected them and was much loved by millions. His message was loud and clear: ”Love your neighbour. Love yourself. You are special.” Rogers, kind, loving and empathetic, was that very rare thing, a very nice person. Several buildings, monuments, and works of art are dedicated to his memory. Tags: A Private War, A Quiet Place, Alessandro Nivola, Björn Runge, Christian Slater, Clive Donner, Disobedience, Emily Blunt, Fred Rogers, Geoffrey Household, Glenn Close, John Krasinski, John Standing, Jonathan Pryce, Matthew Heineman, Morgan Neville, Peter O'Toole, Rachel McAdams, Rachel Weisz, reviews, Robert Tanitch, Rogue Male, Rosamund Pike, Sebastián Lelio, The Wife, Won’t You Be My Neighbor?